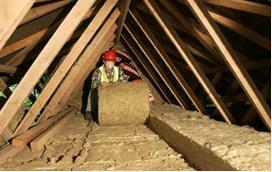 Loft Insulation (or Roof Insulation) is an absolutely essential part of an energy efficient home. Heat rises, and it passes through roof tiles very easily. If your attic or loft is not well insulated you will be sending enormous amounts of expensively heated air through your roof leaving you cold and the birds with warm feet. Effective roof insulation is worth at least 15-20% off your heating bill, and so the costs can be paid off in just a year or two – one of the fastest payback periods for low carbon home improvements. Insulating a loft is a relatively simple DIY task, but you may of course prefer to employ the services of a professional as it can be a dusty, unpleasant, and cramped job. 100% grants are available in some UK regions, and much of the insulating material sold in DIY shops around the UK is subsidised by energy companies such as E.ON – for example, with buy one get one free offers. The commonest type of roof insulation is blanket insulation (aka quilt insulation). This is sold in varying thicknesses, typically on rolls which are 1200mm wide. It is designed to fill the gaps between the roof joists which are almost always 400mm or 600mm apart. Therefore, the roll can either be sawn in two (for 600mm gaps) or in three (for 400mm gaps). New UK homes should have insulation 270mm deep, Since joists are typically 100mm high, the easiest way to achieve the stipulated depth of insulation is to use 100mm thick insulation between the joists, and then cross lay 170mm thick insulation across the joists. Blanket insulation is typically made from glass fibres which are made from recycled glass bottles. 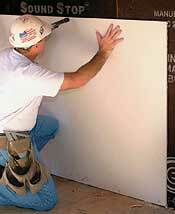 Other types of insulation are also available – namely sheet insulation and blown fibre insulation. Sheet Insulation (e.g. 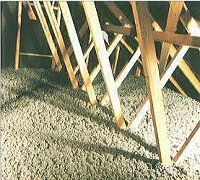 Kingspan or Celotex) is usually much more expensive than blanket insulation, and is used to insulate the sloping underside of the roof rather than the attic floor. This form of insulation is found in most modern loft conversions, and it can be covered with plasterboard to give a nice finish (as pictured above). Blown Fibre Insulation is usually installed by a professional. Fibrous pieces (often made of flame retardant recycled paper or wool) are blown between the joists using a hose. It is therefore a very quick process, but is not very practical for lofts which are to be used for storage or habitation. If you intend to board out the attic so that it can be used for storage, you must ensure that the insulation is not compressed since it will not be so effective. Instead either raise the floor so that sufficient insulation can fit underneath it, or use boards backed with insulating material in addition to insulation between the joists. If you want to convert the attic into a habitable space, then all insulation should instead be fitted between the roof joists since you want the attic space to be warmed by the heat rising from the rooms below (but still not let the heat escape through the roof). Loft insulation materials can irritate the skin, eyes, and throat – particularly in an old dusty attic. Therefore always where a long sleeved shirt, a dust mask, and gloves when installing blanket insulation, and take care to ensure none gets into your eyes. Most home insurance policies do not cover people putting their foot through the ceiling, so lay a sturdy plank of wood across a few joists and kneel on that rather than trying to balance on the joists. See also our article on Cavity Wall Insulation for more information about home insulation.